Hello everyone! I missed last week, so I have two Avery Elle cards for you today! The first card uses the fun Fly By set. This set is so unique with the dies for the cloud writing! The background was done in stages. I masked off a circle and blended ink in for the sun. Then I masked the sun and sponged a cloud background (you can pick up the free Silhouette cut here). I stacked a couple of the "hello" cloud writing die cuts so they were a bit more 3D. Aren't those dies fun? This second card is for my niece and I used the This Book stamp set and the coordinating Bookmark dies. My niece is 6 years old and she's getting into books more and more these days. So I thought a personalized bookmark would be just the thing to encourage a little girl to read;) The fun heart paper is from the Happy Collection pad. And of course, it matches the little pink owl on the card:) Now all I have to do is find her next book! 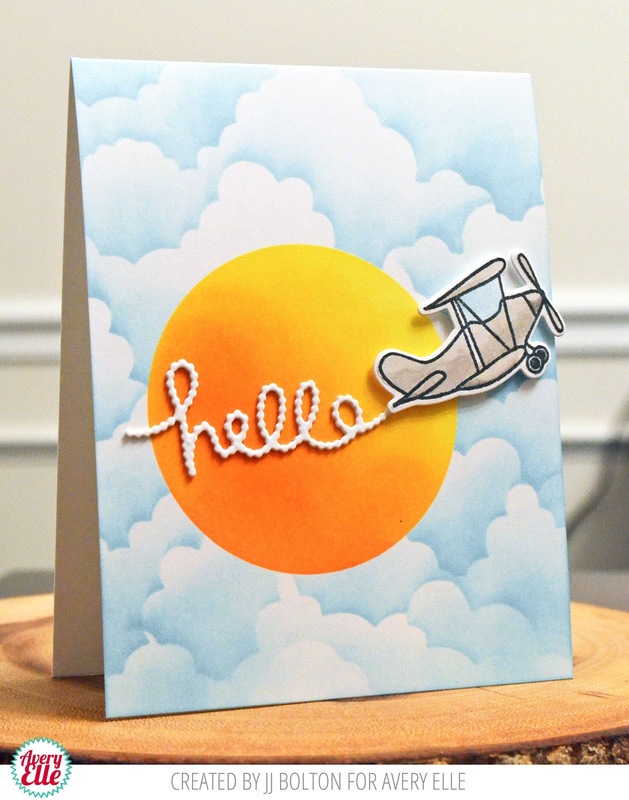 Beautiful blending on your sun, which is perfect for the cloud writing hello die cut! LOVE your clouds, too...I always use your template ~ Thank you! Such a pretty card and bookmark for your niece! I love the chalkboard look for the books and your pom-pom is so sweet! I'll bet she loved it, too!